Puzzle games are among the most popular, ever. In fact, the most popular individual gaming franchise on mobile (Angry Birds) is a puzzle game. The genre has evolved consistently and developers have been finding new and exciting ways of teasing our brains, making us think, and stumping us entirely. It also helps that puzzle games are easily playable on mobile devices which has only helped skyrocket their popularity. Today we offer you our favorite puzzle game, called Fours. 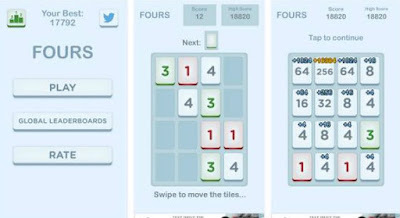 It is a 2048 number puzzle game brought to all Android users by the developer Richard Stranberg, designed with soothing graphics, smooth UI and clear font. 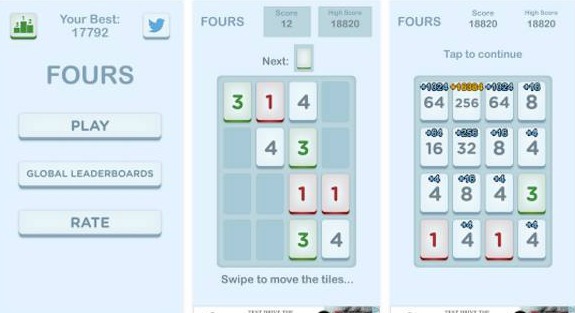 The gameplay of Fours is simple yet very challenging, similar to 2048 and Threes. The controls of the game are simple: swiping on the screen up, down, left or right, depends on how you want the tiles to merge. The goal the player needs to reach is to put tiles with the same numbers next to each other and make the highest possible number tile. The thing that makes this game so challenging and difficult is the fast that the number 1 can be paired with the number 3 only and vice versa. Try to make your highest score and don’t forget to compare it within the online leaderboard. Download Fours 2048 number puzzle game for free from Google Play and make sure to share it with everyone around you.